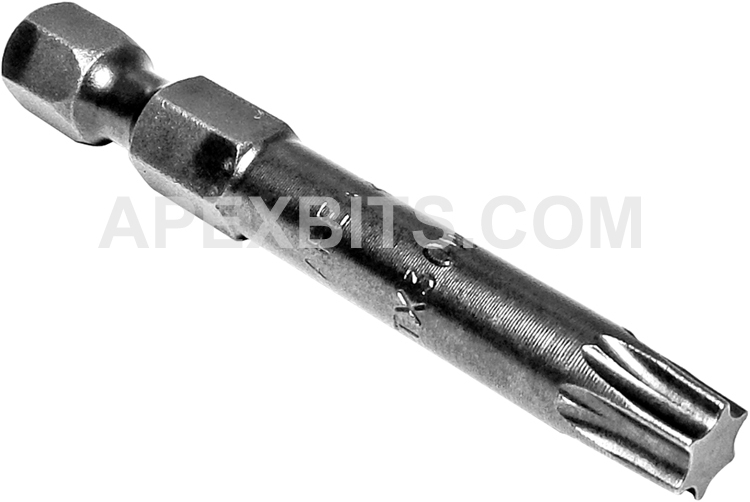 Apex 1/4'' hex power drive Torx bits - Torxalign from Apex Fastener Tools, formally Cooper Tools. Torx fasteners are becoming extremely common in automotive repair and appliance assembly. By design, Torx head screws resist cam-out better than Phillips head or Slotted head screws. Where Phillips heads were designed to cause the driver to cam-out, to prevent over tightening, Torx heads were designed to prevent cam-out. The reason for this was the development of better torque-limiting automatic screwdrivers for use in factories. The 49-TX-30-W 1/4'' Apex Brand Torx Power Drive Bits, Torxalign is one of thousands of quality tooling products available from MRO Tools. Please browse Apex 1/4'' Torx Hex Power Drive Bits - Torxalign for tools similar to the 49-TX-30-W 1/4'' Apex Brand Torx Power Drive Bits, Torxalign. 49-TX-30-W 1/4'' Apex Brand Torx Power Drive Bits, Torxalign description summary: 1/4'' Apex brand hex power drive Torx bits Torxalign. driver size: T-30 major diameter: 0.216 body diameter (in./mm): .236/ 6.0mm overall length (in./mm): 1 15/16'' 49mm Quantity discounts may be available for the 49-TX-30-W 1/4'' Apex Brand Torx Power Drive Bits, Torxalign. Please contact MRO Tools for details.